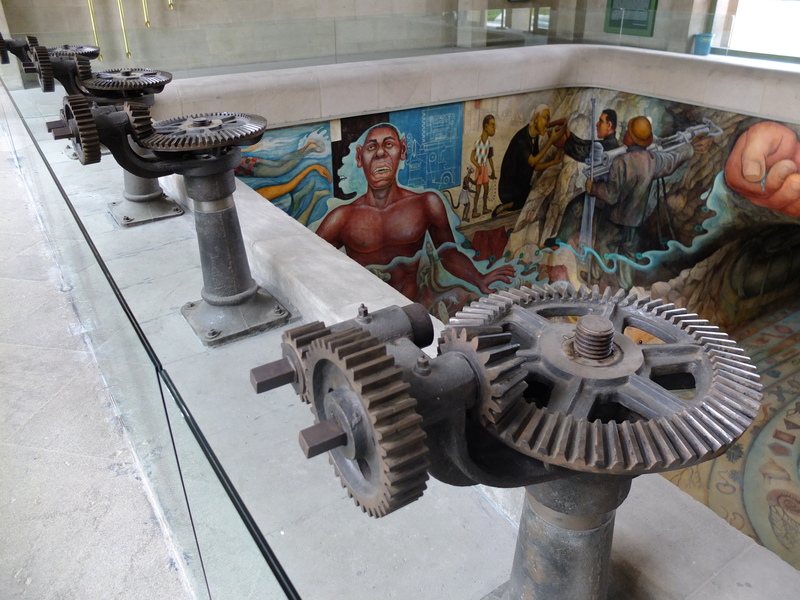 The history of Mexico City can be told through the ways in which water flows both into and away from it. 500 years ago, the then capital of the Spanish Viceroyalty of New Spain was a city undergoing an unparalleled transformation. The conquest of the indigenous lands was set to change not only the politics, economics, and society of this territory, but also its environment. Once covered by five interconnected lakes, two freshwater and three brackish, the Spanish set to desiccate the basin, transforming it into a valley. They did this through canals, tunnels, and other water infrastructures, built by the hands of thousands of workers, mostly indigenous and forcibly conscripted to carry out this labour. By the beginning of the 20th Century, the desiccation was almost achieved, except from some lacustrine areas south of Mexico City that were left. The Mexican capital could finally enter modernity, cleared of the waters that hampered its economic development and made it sick, according to the elite in power. After the problem of desiccation was apparently solved, a new set of issues appeared. Mexico City was now facing the permanent risk of scarcity, as it grew far beyond its previous limits. In response, water was tapped in the springs of Xochimilco, the last remaining lake in the Mexico Valley, currently at risk of disappearing. Soon, this supply was not enough. New sources were surveyed. Amongst them, it was the Lerma area, another lacustrine system, located 50 kilometres away from downtown Mexico City. The Lerma area is part of a neighbouring valley, slightly higher than that of the Valley of Mexico, and separated from it through a mountain range called Las Cruces. 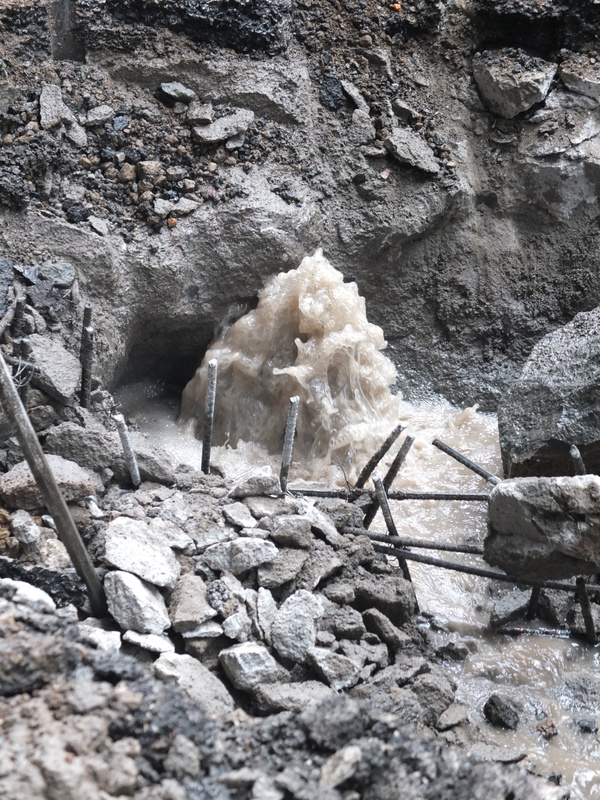 As with the issue of draining the valley, supplying it with faraway waters required the construction of a new set of water infrastructures. These make up the Lerma System, built between 1941 and 1952 by largely anonymous workers, many of whom perished in this process. The Lerma System still works today, alongside another inter-basin water transfer: the Cutzamala. This system was built later, between 1975 and 1993, although there are plans to further expand it. These two water transfers meet in the Lerma area, where the water they carry mixes and crosses the Las Cruces mountain range through a 14 kilometre tunnel that terminates at the Chapultepec Forest in central Mexico City. 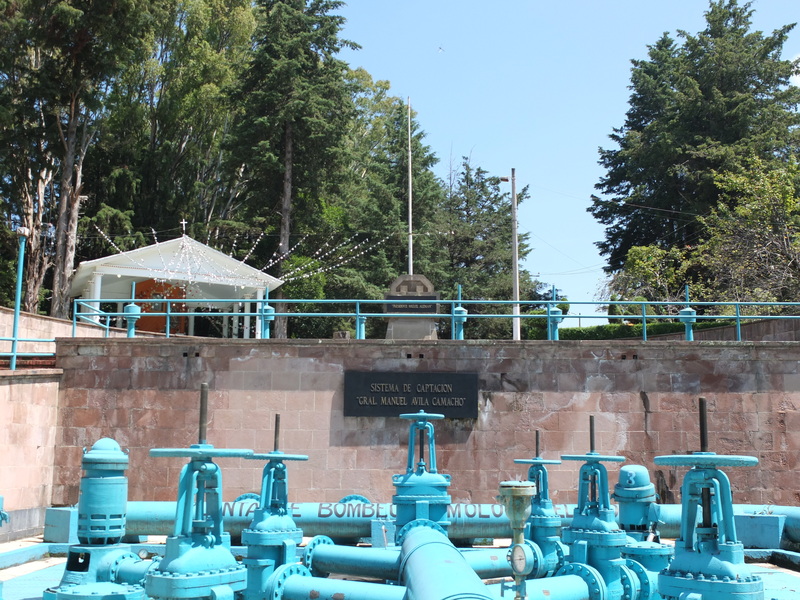 Together they supply Mexico City with 42% of its total water consumption, of which 12% corresponds to the Lerma System. 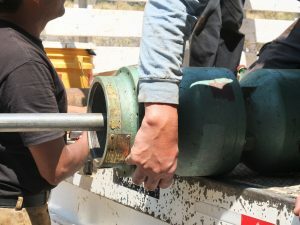 The rest of the city’s water supply comes from artesian wells in the Mexico Valley itself, which are causing rapid ground subsidence in Mexico City as they are overexploited and depleted. Outside of the city itself, the environment has also been transformed. 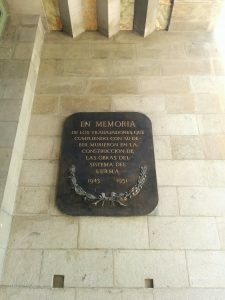 In the Lerma area, the lagoons have disappeared, their waters captured through 300 or so wells managed by the Mexico City government. 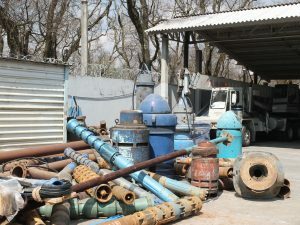 They are extracted, filtered, chlorinated, and pumped towards the Mexican capital, where they are unequally distributed through a series of networked infrastructures: wells, pipes, pumps, and engines, all working to urbanise water for Mexico City. As always, these infrastructures do not sustain themselves automatically. To operate, they need to be constantly repaired and maintained. To become embedded in the making of water, the environment, the city, and the many institutions that seek to shape and control them, they need human work. 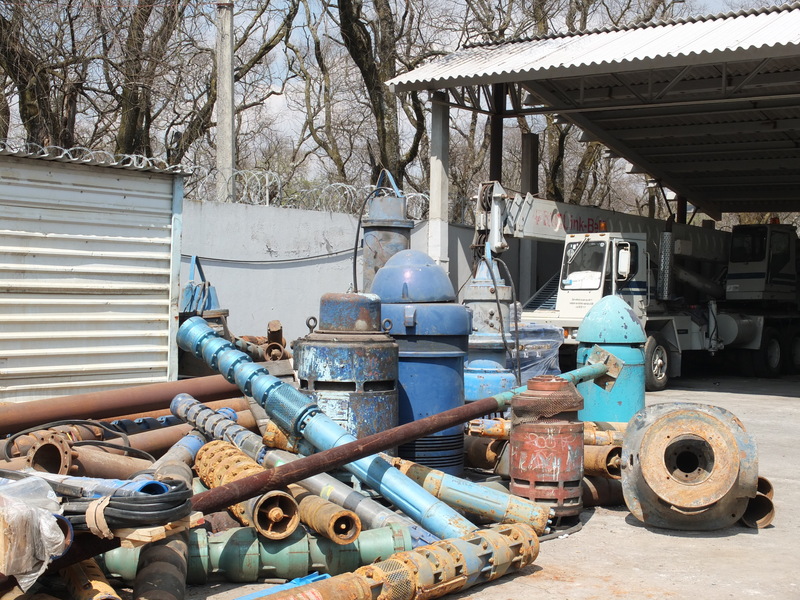 For a year, I followed and worked with the Mexico City water system repair and maintenance teams as they fixed diverse breakdowns in the infrastructural paths of the Lerma waters. 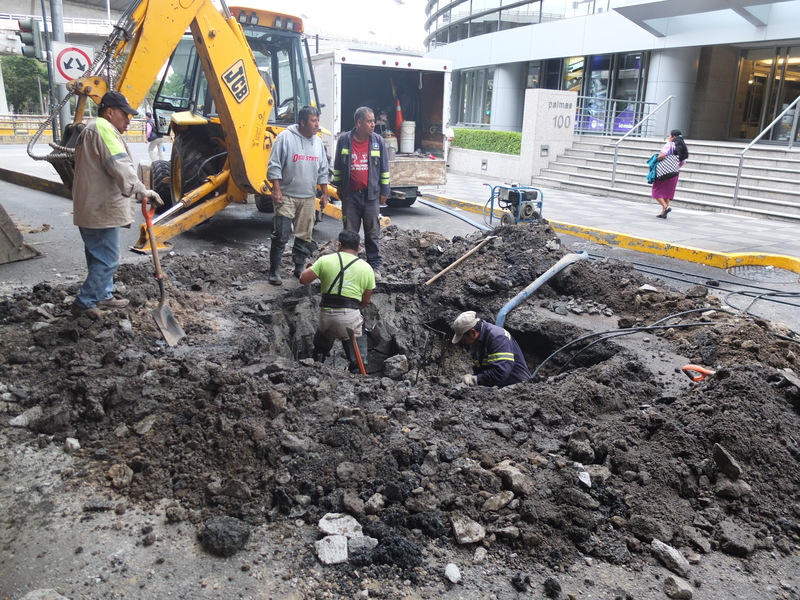 These workers are employees of SACMEX, the public utility company that manages the city’s water. The company is systematically underfunded; last year, it faced a budget cut of close to 70%. This was not an anomaly by any means, but the continuation of a financial situation that has been long the norm in the system. Materials are scarce, infrastructures are in a constant state of decay, and available urban water is rapidly depleting. It is in this space that workers must keep infrastructures working, and through it sustain the political ecological processes that make up city, country, the state, the environment, and their own livelihoods. The everyday work of these teams is characterised by ingenuity and improvisation. Workers fix failing infrastructures through patchwork practices. These are a form of bricolage, in which workers scavenge, sort out, and reassemble scrap pieces from broken down infrastructures. Through this form of practical knowledge and embodied expertise, workers upkeep the system, patching it constantly. By maintaining and repairing the system, the many political ecological relations that it bundles are also reproduced. The making of water into a resource, its urbanisation, and the myriad environmental transformations it has brought about both in town and country are all made durable in time through these labour processes. In that way, work becomes a way to explore wider political ecologies from a situated practice; it is an everyday point of view that offers a particular way to understand both change and continuity. 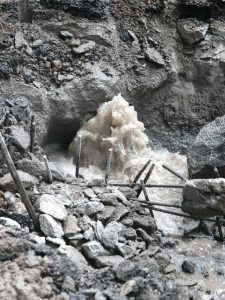 A leak is found after digging under the streets of downtown Mexico City. Workers are acutely aware of the weight their work carries. Often they talked about the fact that infrastructures had brought modernity to many rural towns and urban neighbourhoods. This modernity meant, for them, the introduction of piped water controlled by the state, and the ways in which this shaped both the landscape and the lives of those whose life depends on this water. As lagoons disappeared and livelihoods were transformed, the issue of water supply became, centrally, one of state power. As they fix leaks and wells, workers are not only allowing for the material transformation of water into a resource, but are also reproducing the control of the state over the environment. They become, as Alfred Loos once said of the plumber, the first artisans of the state. They patchily sustain a set of political ecological relations that, from the ground, appear not as overwhelming and seamless but rather fragile and porous while still durable and deep. Following the work of repair and maintenance in the Mexico City water system is a way to situate urban political ecologies. By looking at labour practices, it puts an emphasis on the ways in which large socio-technical systems require constant care to keep working. This standpoint allows us to see how matters of socio-material production and reproduction are always already entangled with infrastructures and with the labour that goes into sustaining them. Analysing how infrastructures are maintained and repaired can reveal how processes of capital accumulation, the reproduction of social class (including of these workers), and the myriad environmental transformations associated with the urbanization of nature are intertwined. This point of view can also change the ways in which we conceptualise and analyse other processes and institutions. The city can be seen here not as a form but as a process, one which extends far beyond its visible borders through the work that labourers do through infrastructures. In this process, the state too is being constantly reproduced, both as an obdurate claim on a specific political ecological ordering and as a porous and flaky process that too must be cared for. At the centre of it all, there is a specific way of producing a historical nature which is geared towards sustaining always expanding urban and industrial processes. In the workers’ everyday practices, these and other processes are stake, fragile yet durable, situated in multiple contradictions.